At Nottingham Mains farm, close to the Doocot at the Wag of Forse (ND212355) is a barn, probably built as a piggery. The two sliding doors hang from a steel rail. 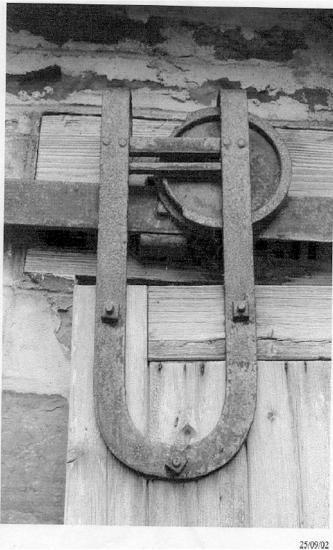 Large diameter wheels run on the rail, but the small diameter axles do not rotate in bearings but themselves roll along short bars from which the door is hung, producing a friction-free movement. The difference in diameters permits a long travel for the wheels for a short movement of the axles. Unfortunately this clever and rare device is in a poor state of repair.